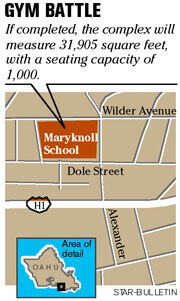 Neighbors challenging a city permit granted to Maryknoll School for its long-awaited gymnasium and community center could stall the project for several months. The city said "new evidence" is prompting a second look at the conditional-use permit issued to the school in November. The school has agreed not to move forward with construction while the review is taking place. MARYKNOLL SCHOOL has apparently agreed to delay construction of its planned $12 million gymnasium and community center while the city takes another look at a permit granted to the school in November. Because of "new evidence," Planning and Permitting Director Henry Eng has decided to reconsider his Nov. 3 decision approving the conditional-use permit, according to a letter by a city attorney to the Zoning Board of Appeals. The appeals board is hearing a challenge by area residents to the permit's approval. The city is expected to request a 90-day postponement for a contested case hearing scheduled to begin tomorrow pending Eng's review, says the letter from Deputy Corporation Counsel Lori Sunakoda. CONSTRUCTION OF the gym/community center was expected to begin this summer. A wooden construction fence colorfully painted by Maryknoll children now surrounds the site. "My understanding is that the applicant is going to be indicating at the hearing it's willing to hold off on any earth-moving activities pending the completion of the reconsideration," Sunakoda said. Sunakoda declined to say what new evidence prompted the city's reconsideration. But Margene Ayers, a neighbor who led the challenge to the permit, said she believes the city miscalculated the number of parking spaces required for a building of the planned size. She said she and other residents believe the school is short by hundreds of on-site parking stalls. Ayers also said the school's plan for theater-style parking and to shuttle people to and from nearby Central Union Church for large events is inadequate in the densely populated neighborhood. "The children want a gym? Great -- we hope that they get a gym, but it needs to be done within the law," said Ayers, who is challenging the permit with nine other residents in her building. Maryknoll School President Michael Baker said the school will work with the city to make sure the project meets all requirements. "Maryknoll's goal is to provide our students with a home court and indoor gathering place for the first time in the 80-year history of the school, without imposing undue hardship on our neighbors," Baker said in a written statement. "We do not know the specifics regarding the city's reconsideration of our conditional-use permit, but, as we move forward, we will continue to work with city planners and are confident any issues will be resolved." THE SCHOOL had originally scheduled a groundbreaking ceremony for the center on June 7, but the event has been postponed indefinitely, Baker said. According to the Nov. 3 decision, the gym and community center sit on a nearly four-acre site bordered by Wilder Avenue, Dole Street, Alexander Street and Halekula Way. When construction is completed, the complex will measure 31,905 square feet, with a seating capacity of 1,000.